Cryptocurrencies make us feels that they are secure because they are all decentralised, with many of them providing anonymous transactions globally. In reality, these features don’t make them any more special to human error and sloppiness. In addition to human mistakes, exposure to external threats exist as well. With rapid increase in the interest of cryptocurrency market which continue to attract new users, so too does it attract criminals. As a result, new scams are born and old ones resurface differently. Currently, the total global value of the crypto market is worth $441 billion, Estimated by CoinMarketCap. Considering that it was just Estimated to be $21 billion a year ago, this illustrates the upward rate the market has undergone. At its highest, it was worth $825 billion at the beginning of 2018. As a result, the possible payout to hackers has the potential to be huge if cryptocurrency assets aren’t well secured. As with most things, some simple but yet crucial steps can be taken to ensure the safty of your digital currencies. Just as you would take steps to protect your valuables, rather than leaving them on display and making them vulnerable to attacts, you should also take steps to ensure the safe keeping of your cryptocurrency assets as well. With scammers and hackers rapidly developing new strategies to scam the crypto community, many young investors and new comers are getting scammed out of their hard investments. Today I am here to show you the vital steps to take inorder to ensure that your digital assets are safe and protected from the scammers of the inter webs. So, without further talking, let’s dig in. When ever you decide to store your crypto assets, just make sure that you only use strong passwords. For some security reasons, memorable information such as birth dates or simple passwords such as the word ‘password’ or number like ‘12345’ should be avoided as these are easy to guess. You can also install a password manager to make hacking of your account more difficult. Two Factor Authentication, also refered to as 2FA, 2 step verification or TFA (as an acronym), is an extra layer of security that is a well known “multi factor authentication” that requires both password and username but also something that only a user has on them, example. a piece of data only they should know or have immediately to hand over — such as a physical token. Also, if you are saving your cryptocurrency assets on an online platform or inside an online wallet, be sure that this platform supports 2FA (two-factor authentication) and don’t forget to enable it. This provides an extra layer of security for your digital currency. Without the 2FA activated a hacker may be able to gain access to your account should it become compromised. 2FA codes can either be sent via text message to your mobile number or with an app like Google Authenticator, which will automatically display a new code within a certain time window. A rapid interest in the crypto market also means that there is an increase in the number of scammers in the crypto world. Phishing attacks are straightforward enough: They are often sent via an email or a fake ads, which includes a link to a website that looks like the website of your online wallet or another account you might be familiar with. When an individual clicks on it they will be redirected to a malicious website. Here you will be required to enter your details unknowingly handing over your information to the hackers. From this, you’ll quickly see your funds disappear. Always do yourself the favour of checking the URL of each website that you are visiting. Many crypto sites are hit with website phishing attacks because attackers know the potential digital assets that they can steal from users entering these sites. Exchanges and wallet interfaces such as MyEtherWallet are known to have many copycat websites available today. Below is a comparison of a fake URL and a legitimate URL. As you can see from the images above, the two URLs appear to be very similar. But with a little eye investigation, you can see the error in the second image. Also, as you can see in the first image, there is a green lock -the left side that says “Secure”. This is an SSL certification that verifies your URL entry is safe and secure where as the second URL contains no such certification which denotes that such site (the second URL) is fake. What’s the point to use all of these tips with an unreliable, non secure wallet? Well, search no further. 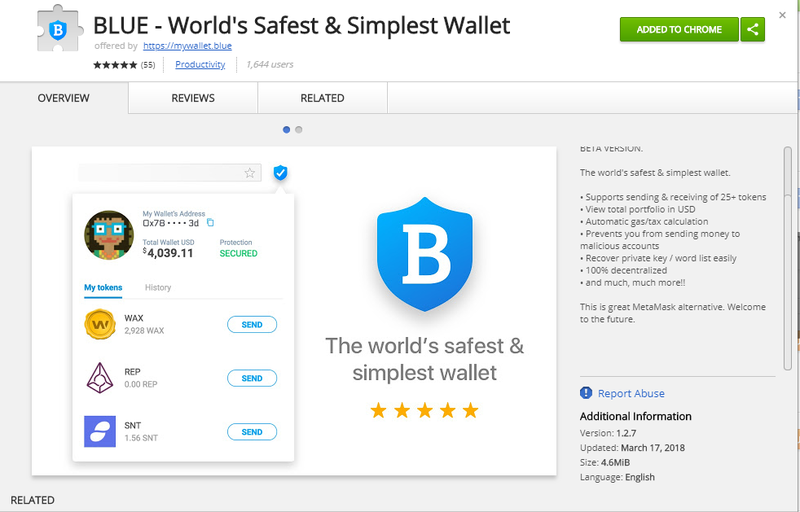 If you are searching for an ERC20 wallet that safely, securely, and conveniently stores your tokens, welcome The BLUE wallet into your life. The BLUE wallet is the latest and greatest product release. Currently in beta, the wallet offers a safe and simplistic way to keep your coins safe from scams and malicious accounts. On top of that, the wallets allows you to view your portfolio value in USD currencies, calculate your gas/tax, recover your private keys, and it is 100% DECENTRALIZED. They currently offer over 25 ERC20 tokens and they’re in the works for allowing ANY ERC20 token to be stored within the wallet.